Shockwave Lab on Weibo has uploaded images of a new LED upgrade for Leader Class Power Of The Primes Optimal Optimus & Rodimus Unicronus. 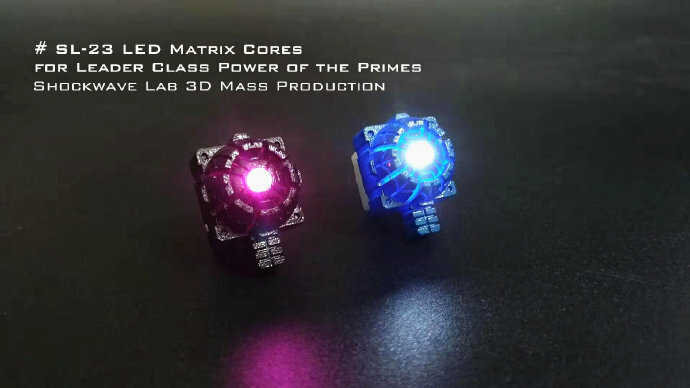 These are new versions of the LED Matrix Cores made before for Power Of The Prime Optimus Prime and Rodimus Prime before. The accessories feature now purple light for Power Of The Primes Rodimus Unicronus and blue light for Optimal Optimus. Just placed them into their respective Matrix and enjoy the light in you display and photographs. Click on the bar to see the mirrored images and let us know your impressions on the 2005 Boards! Just got both sets (not a bad turn around from China) and I love them. Too bad the SL-23 won't fit in Primal since I have the throne version. I can't decide if I want him to swap in the black one or give it to Nemesis Prime. Whats the ebay account name? His ebay user name is johosontony. I just checked and my light up matrix for Siege Prime is probably arriving Monday, Tuesday at the latest. If you want to hold off until I get it to make sure he's still legit, I'll report back. EDIT: Got it. And while the outer box was a little smashed the item itself was fine. Well made too, doesn't feel cheap at all and as if it was meant as part of the figure from the get go. 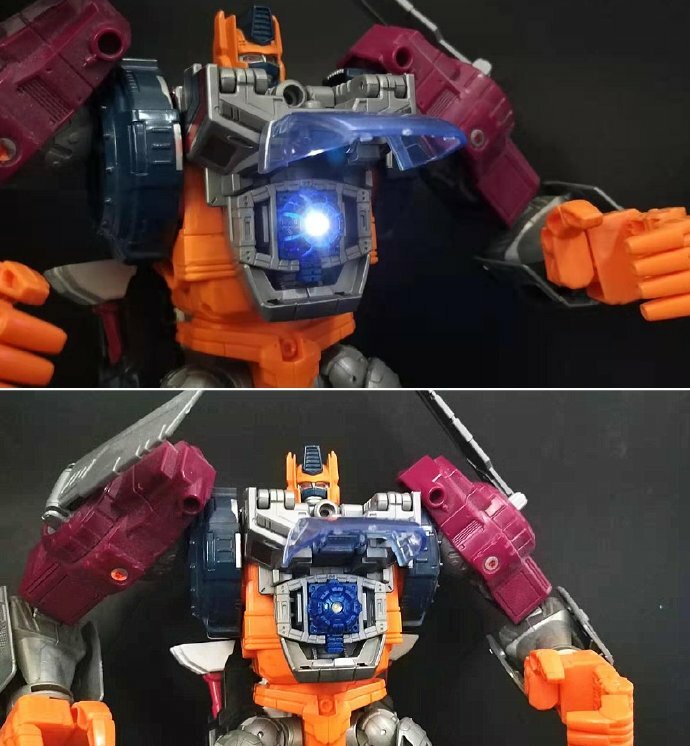 hey so does anyone know if they ever made posable hands (or a diferent matrix handle) for PotP optimus ro hold the matrix? Sometimes you can find them at usual online stores like Robotkingdom, BBTS or TFSource. Once they show their products they are usually available on Ebay. Robotoybase also has some Shockwave Labs stuff. 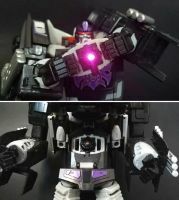 I like these but which seller is actually Shockwave lab? I'd like to support them if I can. I don't think they sell directly, you'll have to use a Chinese seller. I recommend unclebillyshop.com. Pretty much him and TF-Direct are the only Chinese direct sellers I trust when it comes to 3rd Party & KO. He also has an ebay account if you prefer to buy through it, but he will mark up the items a few $ to cover ebay fees. I guess they've found their niche. I just bought their one for Siege Voyager Optimus Prime. The blue light would be perfect for my PotP Rodimus and Optimus Prime. Oh, they already came out with a blue light set for them, SL-23. The thread title should actually be "SL-23N". Nice, just put an order for these with Uncle Billy. C. I'd like to see these in other colors like purple, pink, green, etc. Yeah, I'd like to see a red one for PotP Nemesis Prime. A. I wish these came with the handle section. B. Does anyone know if this will fit in TR Sixshot's chest? With and without the handles? Once again, simple and effective. Those are new versions of the ones released before for POTP Optimus Prime and Rodimus Prime, now in purple light for Rodimus Unicronus and blue light for Optimal Optimus. These should be av available via Ebay now.